Indy films definitely hit a substantial delay in finding their way to my new home in Greensboro, NC, so after a month or so of waiting, I finally had a chance to see Good Night, And Good Luck this past weekend. Heading into the film, I had already regarded Edward R. Murrow a warrior for exposing the truth and championing the rights of the common man and woman, but if GNAGL enlightened me to anything it was to his absolute dedication to a pure journalistic method and a deeply, refined and realistic business acumen. With his classic, stoic, “just the facts ma’am” delivery, Murrow captivated his audience. He came across as an authority figure to the less media savvy audience of the 1950’s, but he also played the role of friend and confidant in the daily struggle to keep on keeping on. Murrow knew very well that if he didn’t consistently frame the paradoxes and contradictions of reality (in this case, Senator Joe McCarthy’s witch hunt), he’d be fair game for criticism and his career would head south. That recognition of ethical behavior and accountability was too refreshing to view on film, because in our modern day, mass media world, those self-applied standards of journalistic integrity have all but flown the coop. 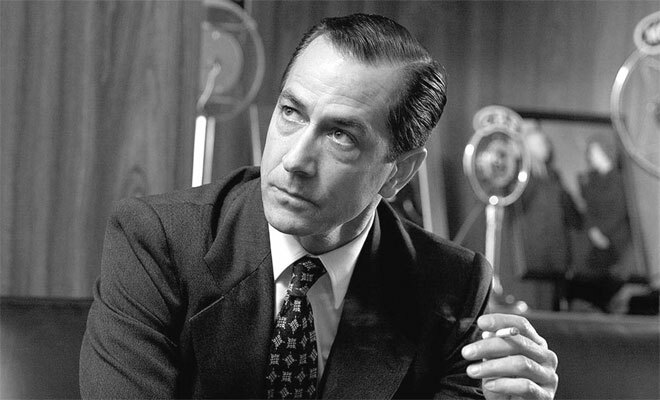 If the film was even close to truly representing the relationship between Murrow and William Paley (the head of CBS), they provided an amazing service by exposing the foundation which drives decisions within the media ecosystem: advertising. While Murrow bartered with Paley at every turn in order to continue exposing the world around him, Paley seemed forever caught between a rock and a hard place; he needed to keep Murrow happy with his role at CBS by providing the latitude necessary to fuel his journalistic passion while somehow balancing the finicky palette of his paid advertisers. The character development of Paley was rich and multidimensional, as I truly felt his angst in the midst of his paradoxical role within such a Darwinesque ecosystem. And to see Edward R. Murrow, champion of the people, interviewing Liberace, well, it spoke volumes about the character of the man. He didn’t play the role of prima donna, refusing to lower his standards to run chatty interviews. He didn’t use an agent to threaten litigation. He recognized his role in adding value to the network by spreading his good name across programming that would return a dollar for Paley and the executive team. Though, the look on his face while he ran a fluff interview reminded me of a look and a feeling I’ve seen and heard hundreds of times over. The majority of present day citizen journalists have day jobs. We design websites, write code, run businesses, multi-task like madmen, etc. Do we all wish we could blog for a living? I’d venture to say that most of us would say yes, as long as we wouldn’t have a strict editorial edict with advertising pressures. You see, we’re a bit spoiled like that. Murrow had to navigate closed, controlled environments with a high degree of grace in order to shed light through one window of opportunity, one night a week. Bloggers? Well, we’ve become accustom to firing from the hip, espousing our opinions, perspectives and, yes, researched journalism on a intra-day basis, with no editor or advertising revenues to be concerned with. Has this new paradigm created irresponsible reporting? No more than the closed venue of the mainstream media. The difference is that we’re now empowered to network common visions and dreams, driving the potential of a new day into an actual sunrise, and the power of that freedom is upsetting the status quo. Corporate media and industries are absolutely petrified by the potential of ordinary people gaining broadcast reach. And as much as I plan on assisting corporate America through this transition into the fast track of iterative development and customer accountability, until they can recognize that everything has changed and that we, the people, are now empowered, I won’t lose one wink of sleep over their concerns. Can There Be Flat Hierarchy? It’s true that if it weren’t for the relentless corporate push to rapidly develop and monetize the web in the mid-90’s, blogging technology might not have come about as quickly. Just as true was that VC investment in the potential of the web greatly contributed to the explosion of the infrastructure of information retrieval — collaborative filtering, search algorithms and now folksonomies. So yes, we are all in this together. The talent needs the funding, but not as much as the funding needs the talent. Remember the last time we danced to this tune: capital power players funded the development of the internet on the shoulders of false stickiness, returning large dividends of ad revenue while the innovators focused on innovation. Many of those same capitalists continued to overinvest by underwriting ridiculous IPO’s until the bubble burst. Was it simply coincidence that a majority of them could reinvest in the internet at a basement entry price, while the talent scrambled about just to retain paid gigs? Now the power players are scrambling to monetize our blood, sweat and tears at every turn, on every feed, on every page, while we continue to blaze paths two steps ahead of them with our eyes focused on the greater good. We’ll keep doing our thing, they’ll keep doing theirs. < Previous Are You A Disciple Like Rosa Parks?